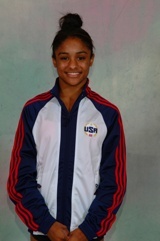 Shenea Booth begins her seventh successful and decorated career as a member of the US Sports Acrobatics National Team. In 2004, Shenea Booth and Arthur Davis won the gold medal in Lievin, France and earned the title of World Champions. Shenea and Arthur defended their US National Title in Palm Springs, CA earning top honors in Balance, Tempo and the All-Around. Shenea also was recognized, with partner, as Athletes of the Year, recipient of the Glen Sundby Award for Outstanding Pair/Group Performance, and Most Difficult Skill. In 2003, Shenea and partner Arthur Davis traveled to Russia, where they placed 2nd in Balance, Temp and All-Around at the Volkov Cup. They also competed in the Freedom Cup and the 2003 National Championships held in Jacksonville, FL. Shenea and Arthur won the gold medal in all events at both competitions. At Nationals, they also won the special awards for Athletes of the Year, High Score of the Meet, and the Glenn Sundby Award for Outstanding Pair/Group Performance. In 2002, Shenea won the gold medal at the 2002 World Championships in Riesa, Germany with partner Arthur Davis. The pair became the first U.S. acro mixed pair to earn a gold medal for the U.S. at a World Championships. Shenea and Arthur brought home the gold in the 2002 National Championships in New Orleans, LA for their performances in the Balance, Tempo and All- Around categories. They also won special awards for the most difficult skill and the highest score. Shenea's accomplishments placed her among the most decorated U.S. athletes in the sport.